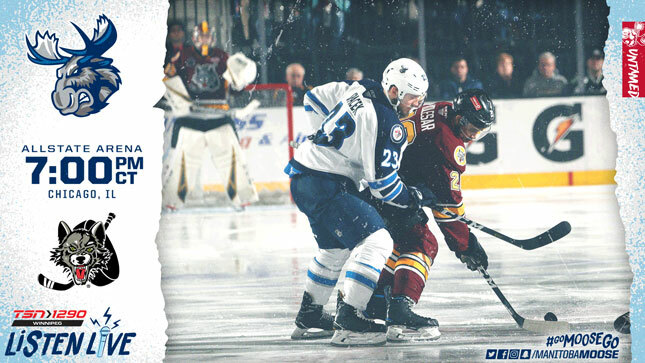 Tonight the Manitoba Moose (38-29-5-2) continue their battle for a playoff spot against the Chicago Wolves (38-25-7-4) at 7 p.m. CT. Moose fans can tune for the game on TSN 1290, moosehockey.com/listenlive, the Moose App, or streaming live on AHLTV. Both Manitoba and Chicago played last night, and now face each other on back-to-back nights. The Moose were in Grand Rapids, where they took down the Griffins 4-1. The Wolves were also on the road, where they fell 2-1 in overtime to the Iowa Wild. Manitoba’s Friday night win came with stellar performances from Jansen Harkins and Eric Comrie. Harkins, who hadn’t scored since March 1, was shooting with confidence. He beat the Griffins’ Harri Sateri twice with whistling wrist-shots. Comrie, who made his first start for the Moose since March 19, showed no rust after being reassigned by the Winnipeg Jets on Thursday. The Moose MVP stopped 28 of 29 shots for his 24th win of the season. Two additional Moose players recorded two-point nights as Michael Spacek and Seth Griffith notched a pair of helpers each. Logan Stanley and Mason Appleton were the other Manitoba goal-scorers making the 4-1 final. Appleton continues to lead the Manitoba playoff charge. The Green Bay, Wisc. native has seven points (4G, 3A) on a six-game point streak. Other than the red-hot Appleton, Griffith may be the Moose to watch. In six games against the Wolves, he’s put up eight points (3G, 5A). For Chicago, Daniel Carr has led the pack with seven points (4G, 3A) in the six meetings, but hasn’t played a game since March 5. The Moose are 27-13-3-2 since Dec. 30, a 0.656 win percentage that has them in the thick of the Central Division playoff race. Manitoba is also 6-2-1-0 in their last nine games away from Bell MTS Place. Manitoba currently sit in fifth place in the Division, but have a game in hand (and the tie-breaker) over the third-place Iowa Wild, who sit two points ahead of Manitoba at 85 points. Milwaukee is in fourth, one point ahead of the Moose and even in games. Amazingly the Griffins, who sit in second, are still within reach after the loss to Manitoba last night. Grand Rapids has 87 points and will play its final game of the season tonight, at 6 p.m. CT in Milwaukee. If the Griffins losing streak reaches nine-games, they could fall all the way from second to fifth this weekend. Most importantly, the Moose can clinch their spot in the Calder Cup Playoffs with a win and an Iowa regulation loss against Rockford. The Moose wrap up their own regular season schedule Sunday afternoon in a rematch with the Wolves. 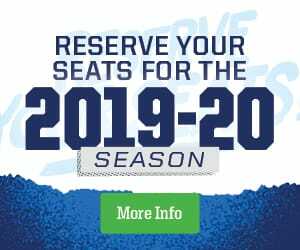 You can tune in for the finale of the Moose playoff push on moosehockey.com/listenlive/, the Moose App, and streamed live on AHLTV with the pre-game show starting at 3:45 p.m. CT.